What Do Vegans Eat? 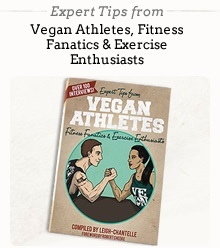 is a scrapbook-style book written by Leigh-Chantelle from Viva la Vegan! focused on putting the fun into vegan health education, dispelling the myth that vegans aren’t healthy and eat boring and bland food. Leigh-Chantelle, an accredited Naturopath, Nutritionist and Western herbalist, created this visually appealing look at the many delicious food options vegans have today and delivers it in her unique, charming, no-fuss style. Food photographs from Leigh-Chantelle’s nutritious and cruelty-free recipes found on her website vivalavegan.net are combined with her inspiring and easy to comprehend overview of the essentials needed to have a healthy vegan diet and lifestyle. Why does someone become a vegan? While Leigh-Chantelle focuses mostly on the food aspects of veganism in What Do Vegans Eat?, she points out that veganism is not just a diet. “Being vegan is a lifestyle and a set of ethical values that myself and many others choose to embrace” she says. “I hope that I inspire others by leading by example to show how easy it is to live in line with your ethics and values.” She encourages all vegans and potential vegans to educate themselves to the other benefits of the vegan lifestyle including: Animal rights and Welfare, Environment and Sustainability, Ethical and moral issues, Health, Spiritual and/or Religious beliefs, Weight loss or control. Viva la Vegan! started in 2005 as a launching pad for the Viva la Vegan! Recipe Calendars created by Leigh-Chantelle, ND. Viva la Vegan! has since grown to be an interactive, multimedia community for vegans focusing on positive education, information and vegan outreach. Through the vivalavegan.net website, Leigh-Chantelle’s focus is on educating people to ethical lifestyle choices, proving that via compassion we can heal ourselves and each other. Vivalavegan.net focuses on easy to prepare recipes, blogs and articles, interactive forum, informative and how-to videos, interviews with inspiring vegans, vegan mentoring and much more. Promoting healing through compassionate lifestyle choices is the Viva la Vegan! motto as Leigh-Chantelle believes in the power of positive influence and inspiration. Leigh-Chantelle lives mostly in sunny Brisbane, Australia and runs the online vegan community Viva la Vegan!, the not-for-profit environmental awareness Green Earth Group as well as coordinates Social Media Marketing. She believes in the rights of all beings, networking, surrounding herself with people on the same life path as her and she is a bit obsessed with quinoa. Leigh-Chantelle is an accredited Naturopath, Nutritionist and Western Herbalist (not practising) who combines her passion for vegan health along with her natural therapies and healing skills. She has released three Viva la Vegan! recipe calendars, a plant-based Detox Diet online e-book, re-released her recipe calendars as recycled recipe cards; and is writing and compiling books for future release. Over the past 15+ years since Leigh-Chantelle has been an eco-feminist vegan she has been involved as a sponsor, performer, emcee, speaker and stallholder for various animal rights, vegan and cruelty-free fundraisers, organisations, festivals and events throughout Australia and internationally. She was recognised by Supreme Master Ching Hai in 2009 for her work on behalf of animals, the planet and in promoting the vegan diet. Find Viva la Vegan! on FaceBook, Twitter, Google+ and Pinterest.